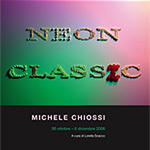 Opening Thursday 30 October 2008 h. 6.30 p.m.
Z2O Gallery is pleased to announce the first solo exhibition of Michele Chiossi in Rome entitled Neon-Classic. The exhibition, curated by Lorella Scacco, revolves around the idea of a rediscovered classic which has reworked by the contemporary glance of the artist through a series of sculptures in marble and neon, in his peculiar stretch zig zag, an original freehand stretch subtracted from curves lines, is directly inspired by the laurel wreaths of the ancient emperors, but in fact derives from the reinterpretation of some famous brands of our time. The trilogy of sculptures entitled Neon-Classic, which is the core of the exhibition, is indeed inspired by the selected logos of Fred Perry, Vintage Mini Cooper and Ladurée. So if the cycle of works is an homage to neo-classical statuary and its vast experience that has its deep and originating roots in Rome, now Chiossi brings us to current time (what he investigates and analyzes in his still lives) through the global choice of some logos that brings new meanings: from clothing (Fred Perry which made apparel tennis as daywear), cars (Mini Cooper, which has recently increased its collections) and the high French pastries (Ladurèe, with its luscious macarons superbly disclosed in the cult movie by Sofia Coppola’s Marie Antoinette). An artistic investigation so that goes in historical, geographical and symbolic fields and characterizes its post production operations, formerly carried out by the mid-nineties in many other sculptures, as in his must of Made in Italy. The light and the colours of neon, which the artist has selected from neoclassical decorations typical drawings, plaster, and Wedgwood porcelain in light tones of pink, blue and green, is a choice both conceptual and technical. In addition to intense light on the sculpture, neon was the first technique and then the media that brought the artist to the title, the cycle of works and their implementation. The exhibition will present a series of original drawings, which proposed again the logos that he reproduces always with a zigzag sudden and mixed media (markers, spray paints, pvc sticker). A new sculpture will be presented at the exhibition, Per Aspera ad Astra. An iconic sphere is carved in a bowling ball made of precious pink quartz enriched with symbolic chicken wings in gilded bronze. Here too the ball and the wings, along with laurel wreaths, are all Neoclassicism symbols from the golden period of Rome through which the Empire informed the concepts of glory, victory, immortality and poetry, but often addressed by Chiossi in the code of his art. The idea of the neoclassicism, which tend to study and imitation of existing prototypes, then extends to the charges addressed by other artists (Boccioni, Manzoni, Boetti, Medardo Rosso) and reinterpretations made by the artist to artists who had tribute to the classic such as Giulio Paolini. Michele Chiossi was born in Lucca in 1970, lives and works in Milan. Among its major recent exhibits one recall: 2007, Let There Be Light, Zonca & Zonca, Milan, 2006, The Jap Diptyque Room, Space Bigli, Milan On Sculpture, Galerie METIS_NL, Amsterdam, 2004, Two Sculptures to end the Season, Maes & Matthys Gallery, Antwerp. His artworks are included in important public and private collections. Opening: Thursday 30 October, 2008 h.6.30 p.m.